Isshinryu is an Okinawan style of karate. It is a relatively recent style, having been developed by Tatsuo Shimabuku in the 1950's. Isshinryu karate is meant for street fighting, and to this end it has been designed for power and efficiency, with little wasted motion. It was brought to North America by US Marines who were stationed on Okinawa and were taught Isshinryu by Shimabuku himself. Methods of unarmed combat have been practiced for thousands of years. The full story of the martial arts is largely lost in legend. What is known however is that Chinese martial arts trace their lineage to the Shaolin Temple of Northern China. A legendary Indian Buddhist monk, Bodhidharma, now known as the father of kung fu, taught there from 526 to 535 AD. He taught the monks breathing and fighting skills, which then spread throughout China. Okinawa is a collection of islands South of Japan and East of China. As in most regions, an indigenous martial art developed. It was called tode. Geography made Okinawa a transshipping point between Japan And China, so the economic and cultural influence of China on the islands had a long history, which peaked with a formal treaty in 1349. Some Okinawans settled in China and some Chinese moved to the islands. Chinese boxing was introduced to the islands though these exchanges. In 1429 the islands were united for the first time, and the new king collected all the weapons and stored them in a central arsenal. This greatly facilitated the successful 1609 invasion by the Japanese Satsuma clan. In 1761, a Chinese military attaché known as Kushanku to the Okinawans, arrived and taught the Chinese art of chuan fa (called kempo in Japanese). Other Chinese attaché known to have taught Okinawans include Chinto and Iwah. Their students mixed the Chinese arts with tode. Although forbidden by the Japanese, the blended art spread throughout the island under the innocuous name of te (hand) or Okinawa te. Te developed into three main regional styles, named after towns: Shuri-te, emphasizing the external styles of China, Naha-te, emphasizing the internal styles of China, and Tomari-te, a mixture of both internal and external (soft and hard). Shuri-te became Shorinryu around 1915. Naha-te split into Gojuryu (hard-soft) and Uechiryu. In 1898, while the tes were transforming into the ryus, the teachers of the new art agreed to call it karate (Chinese hand). 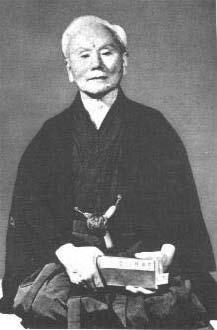 The most famous modern karate teacher was Gichin Funakoshi, pictured at right, the father of shotokan. He taught karate in the transition period when karate stopped being a secret practice and came into the open. He is credited with the first demonstration of karate outside Okinawa and was instrumental to its spread and the introduction of women to the art as well. In 1930 the meaning of karate was changed to empty hand. Shinkichi Shimabuku was born in Chun Village Okinawa on September 19, 1908. By age 14 he started studying Shuri-te from his uncle, Kamasu Chan. Later he studied Shobayahiryu (the original Shorinryu style) from Chotoku Kyan. Then he studied Gojuryu under Chojun Miyagi. By the time World War swept up Okinawa, he was a well known karate teacher. At first, he avoided conscription into the Japanese army by becoming a farmer, but later the situation worsened; the Japanese wanted every able-bodied man, so he went into hiding. Such was his reputation that many soldiers were sent to capture him. The officers who finally caught him kept his location secret in exchange for karate lessons. Once the war ended, his business destroyed and the economy devastated, Shimabuku turned to farming for a living, but continued to train. Desiring a system with the power of Gojuryu and the speed of Shorinryu, Shimabuku gradually forged his own style by combining elements of these styles during the 1950s. He announced the creation of the style officially on January 15, 1956. Isshinryu means one-heart method, or one-heart school. The name was chosen because in the words of the master, all things begin with one. The style spread to America via US Marines returning home from Okinawa in the late 1950's. Among the men who brought Isshinryu to North America were the marines: A.J. Advincula, Steve Armstrong, Don Nagle, Harold Long and Harold Mitchum. Named Shinkichi Shimabuku at birth, Shimabuku took the name Tatsuo (Dragon man) at adolescence, and was later nick-named Sunsu (Strong man). 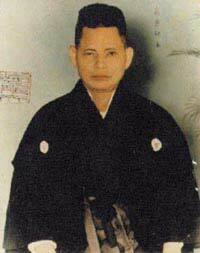 Arcenio J. Advincula - a leading teacher and historian of Isshinryu, he also created the patch. The emblem was created by Arcenio J. Advincula in 1961. The crest of Isshinryu is based on a daydream that Tatsuo Shimabuku had while he was creating his karate style. It is called 'Isshinryu No Megami' (or Megami for short), which means 'Goddess of Isshinryu'. It is often incorrectly referred to as 'Mizu Gami' or 'Water Goddess'. The original patch was designed by Sensei Advincula. The border symbolizes the vertical fist, the primary trait of Isshinryu. The megami is half woman and half dragon. The upper body indicates that karate can be gentle as a woman, and is symbolic of 'soft'. The lower body indicates that karate can be fierce as a dragon if needed and signfies 'hard'. The megami's left hand is open, the universal symbol of peace and 'soft', while her right hand is closed in an Isshinryu fist, symbolic of 'hard' and ready to be used when necessary. The dragon ascends from the water into the sky and symbolizes heaven. Isshinryu's founder's name Tatsuo means 'dragon man'. The tiger in the megami's headdress stands for earth. The dark background with the three stars stands for night and the unknown. The three stars have several meanings. They represent Shimabuku's three teachers, Isshinryu's three elements (Shorinryu, Gojuryu, and Kobudo), as well as mind, body andCspirit. The three stars are in one line, the Chinese and Japanese character for one. Sensei Shimabuku told his students that all things start with one, and Isshinryu means 'one heart method'. The calm face of the goddess in a storm represents that one must be calm, especially in times of danger. The turbulent water and storm symbolizes danger, which is always present. The Japanese characters mean Isshinryu karate. I come to you with only Karate, empty hands. I have no weapons, but should I be forced to defend myself, my honour or my principles, should it be a matter of life and death, of right or wrong, then here are my weapons, my empty hands. A person's heart is the same as Heaven and Earth. The blood circulating is similar to the Moon and Sun. The manner of drinking and spitting is either hard or soft. A person's unbalance is the same as a weight. The body should be able to change direction at any time. The time to strike is when the opportunity presents itself. The eye must see all sides. The ear must listen in all directions. 1. A person's heart is the same as Heaven and Earth. One can no more go against the prompting of one's true heart than the heaven and earth can disobey natural law. The power or energy of nature is much like man's power (the tremendous power of focused nature--like the waves in the karate crest-- is like the focused energy of a master karate-ka). 2. The blood circulating is similar to the Moon and Sun. Human nature, given the right aspirations, is as reliable as the daily round of sun & moon. It (human nature) is something to be trusted. Sensei trusted his own nature, let go, dreamt, and found the soul of his art. There is often more than a single way to accomplishing the same goal (or even the same move). 4. A person's unbalance is the same as a weight. A divided self accomplishes little, because it is unbalanced, weighted down with unnecessary knowledge. A properly weighted self, a balanced, unified self, however directs single-minded energy to achieving a single-minded goal. 5. The body should be able to change direction at any time. 1) should be able to alter the position of one's body swiftly & naturally at any moment; this is essential for good fighting technique . 2) more broadly, one should adapt to circumstance, in life as well as kumite; only by being supremely flexible can one master Karate & life. 6. The time to strike is when the opportunity presents itself. ..in life, as in battle. 7. The eye must see all sides. In a fight you have to be aware of your surroundings because an attack could come from somewhere you don't expect. In regular life this means that you should be able to evaluate all sides of a situation before taking action. 8. The ear must listen in all directions. This one's similar to 7. In a fight, you don't need to only use your eyes. You might be able to hear an opponent approaching from behind. In regular life this might mean that you listen to all sides of a debate before making your decision.